During the First World War, Le Treport was an important hospital centre. No 3 General Hospital was established there in November 1914, No 16 General Hospital in February 1915, No 2 Canadian General Hospital in March 1915, No 3 Convalescent Depot in June 1915 and Lady Murray’s BRCS Hospital in July 1916. These hospitals contained nearly 10,000 beds. No 47 General Hospital arrived in March 1917 and later that year, a divisional rest camp and a tank training depot were established in the neighbourhood. By March 1919, the hospitals had been closed and Le Treport became the headquarters of the 68th Division, which re-formed there before going to the Rhine. The divisional supply depot was closed in June 1919. 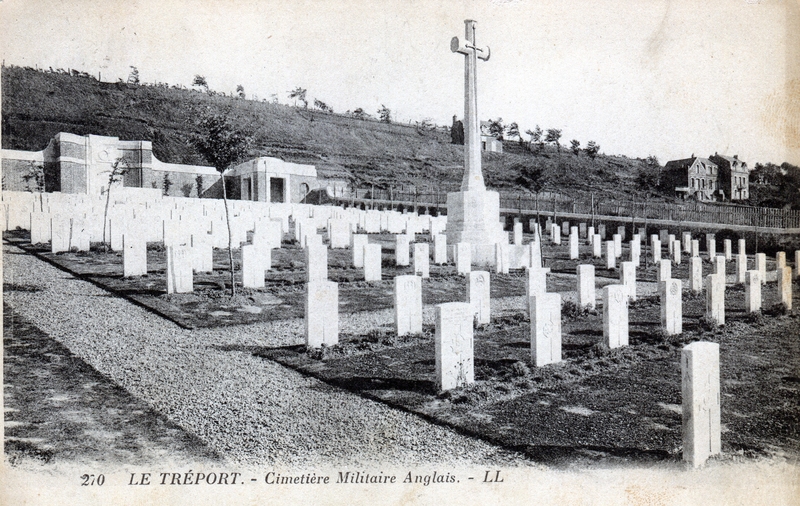 Le Treport Military Cemetery was started in late 1914. There are now 445 Commonwealth burials of the First World War in the cemetery. Three of the four Second World War burials are unidentified. The cemetery, one of the first three Commission cemeteries to be built after the First World war, was designed by Sir Reginald Blomfield.